Danny Kerry, the England and Great Britain men’s coach, has offered Ashley Jackson, one of this country’s most gifted stick players, a potential route back to the international scene ahead of Tokyo 2020. An “open door” had been left ajar by former coach Bobby Crutchley ever since he quit the national programme in the aftermath of Team GB’s ninth place finish at Rio 2016. Closure then looked inevitable when club hockey was put on hold as he focused on his ice hockey career via stints with Invicta Dynamos and Basingstoke Bison. At the time – in March last year – he said he was taking a break from the game to “rejuvenate myself”. With England Hockey’s procedure meaning that playing abroad would make it impossible to play at international level, his decision to sign for two years with HGC in the Netherlands could – at 31 – spell the end of Jackson’s path towards another Olympics. But in an interview with The Hockey Paper, conducted before the Hoofdklasse season, Kerry was prepared to offer Jackson an olive branch after his departure from the national programme in January 2017. Of even more interest will be Kerry’s view now, given that eight games into the Dutch season, Jackson is top scorer in the Hoofdklasse with 11 goals (three outfield and five PCs) and coming off a weekend hat-trick. “Ashley has already touched base with me and it’s about understanding where his head is at and for him to understand where the programme is at,” said Kerry. If there is a route back into the international fold, Jackson would obviously have to leave the club which has seen him rekindle form against some of the world’s best players. Kerry added: “The integrity of the programme comes first, but ultimately the greater good of the team will be the No 1 thing. That doesn’t mean it precludes Ash but it means he will have to think what his ultimate ambitions are. Kerry accepted the men’s role two weeks after England women disappointingly exited the World Cup in London. “I’ve looked at the men’s programme for a number of years,” added Kerry. “I wondered whether at some point I would ever coach the national team. That opportunity had never really presented itself. Kerry is “excited” about where the men are in their progress post-Rio. He says there is hunger there after bronze medals at the EuroHockey and Commonwealth Games and young talent too. Had Kerry’s time at the helm run its course? England’s World Cup displays at times certainly looked edgy; at times devoid of any game plan. By the end, the gulf between the world’s No 1 and No 2 sides could not have been greater. “There is no doubt that there is clear blue water between the Netherlands and the rest,” said Kerry. “There are a number of factors on the women’s programme where the chips didn’t fall for us. The unavailability of Shona [McCallin] and Nic [White] meant that the depth of competition in an English context was perhaps not what it needed to be. “Having said that, we didn’t take our penalty corners but we played and competed pretty well. 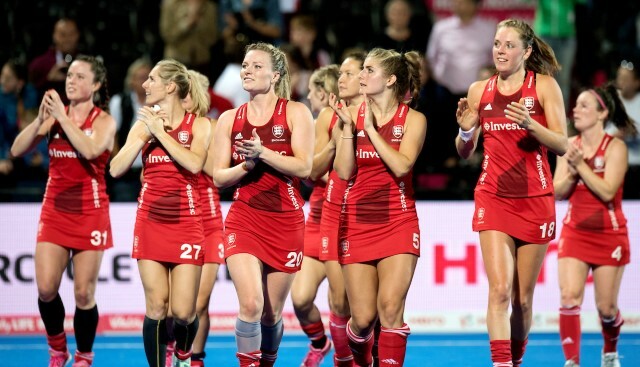 “When we become Great Britain and you add in the likes of Sarah Robertson, Amy Costello and you get Shona and Nic fit, there are younger players who have potential to be very very good players, I think it is in a good position. Ahead of the men’s World Cup, Kerry, who started his new role on September 3, is relishing the prospect of breaking down the world’s best defences. He said: “The interesting thing going on in the men’s game at the moment is a large number of teams are using a zonal defence. In the women’s game, that has been happening since 2008 with the presses and the defence. This week, he has added several new faces for the two Belgium matches in London, the second of which celebrates the 30th anniversary of Great Britain’s Olympic gold in Seoul. And Kerry knows all to well how the implementation of Roger Self, as manager, and David Whitaker, as coach, changed British hockey. “You had a yin and yang. Roger was black and white ‘this is the way I was in charge’ and David was very much the opposite, trying to make athletes think about the game. These were two people who were very seminal in that golden era. “It will be fantastic to have the ’88 team around and it was brilliant what England Hockey at the World Cup in bringing back all the previous players still alive and what we are now doing with the 1988 team.